Today, at the headquarters of the Organization of American States (OAS), delegations of Belize and Guatemala, headed by their respective Foreign Ministers, the Honorable Wilfred Elrington and His Excellency Haroldo Rodas Melgar, met with OAS Secretary General, José Miguel Insulza, in a highly cordial and cooperative atmosphere. 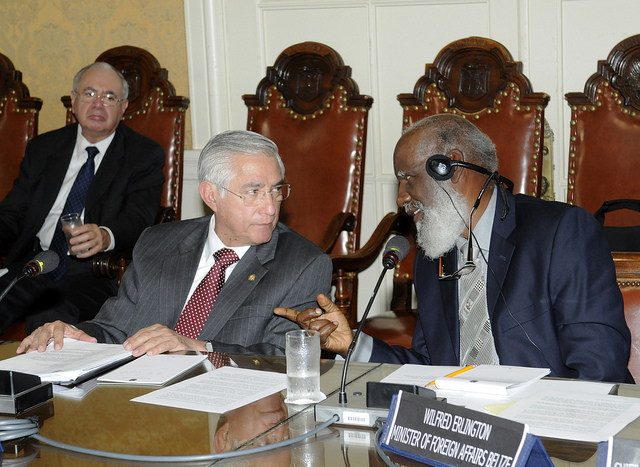 The Foreign Ministers expressed their profound appreciation to the Organization of American States and its Secretary General, and underscored the effective and efficient work of the OAS Office in the Adjacency Zone between Belize and Guatemala, which has been working since 2003 to maintain peace and stability between the two countries. Both Minsters also clearly recognized the political, technical and financial support provided by the Group of Friends of Belize and Guatemala over the years, and most recently by Canada, Mexico, Spain, the United Kingdom and the United States of America. In this connection, they also agreed to convene, along with the Secretary General, a meeting of the Group of Friends in Guatemala City on December 12, 2011. The OAS Secretary General welcomed the renewed commitment of the Foreign Ministers to comply with the terms of the Special Agreement, signed on December 8, 2008 under the auspices of the OAS, with regard to holding the simultaneous referenda. To this end, the Secretary General will convene a bilateral meeting immediately after the electoral processes in Belize have concluded, with a view to holding the referenda before the end of the year 2013. The Secretary General urged the Parties to begin the education campaigns aimed at sensitizing the public, prior to holding the referenda, and reiterated the full support of the OAS to carry out this task. The Foreign Ministers also agreed that the Secretary General would convene a meeting of the High–Level Working Group during the first quarter of 2012 to strengthen cooperation and coordination between inter-governmental agencies, as well as to identify joint opportunities and programs in the fields of education, technical cooperation, and development to consolidate the already friendly relations between the two neighbors. A gallery of photos of the event are available here.